According to a Walker study, by the year 2020 customer experience will overtake price and product as the key brand differentiator. That is why it is important to stay connected with your customers and keep them informed about your company innovations and events. You may attract new customers with help of great content. However, to keep them you need to offer exceptional customer experience. Over the next five years 41% of B2B and 47% of B2C organizations will try to differentiate from competition with help of great customer service. Superb customer experience generates a positive buzz among other customers and their friends. 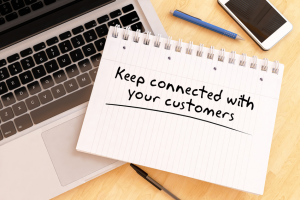 In this blog post I would like to offer you 6 strategies you may take to stay connected with your customers and create positive customer experience. Let your customers know that you are there to assist them and offer your best pricing. It would be also great if you notify them in advance about coming campaigns and new products or features. Here are some ideas you can use to include to your newsletters or customers’ orders. Educational information, like e-books, free webinars, video materials, user guides, infographics, blog articles. Kind words cost little but are worth much. When you offer great customer service, complimentary tutorials and free webinars, your customers feel you are concerned. The success of your business is in hands of your customers. When your customers are happy your business grows, keep this always in mind. Win your loyal customers with help of personal touch. In this article by my co-worker Maria you can find 8 great tips for offering personalized customer service. A customer Advisory Board is a great way to truly understand customers and find ways to improve your product. Invite your key customers to test your new website or become beta testers of your new software features before their official release. This way you will gather valuable feedback and stay closer to your customers. It is quite common these days for companies to send promotions, discount offers, or simple “Many Happy Returns” messages to their customers before or on their birthdays. Sending a birthday message can be a great way to say thanks to customers for their loyalty and to encourage them to take advantage of your birthday offer. We live in the world where retention in business matters more than ever. If you offer your products or services online it does not mean there should not be any personal touch. A hand-written “Thank you” or a “Many Happy Returns” note as well as a small box of cookies will surprise your customers and show that you value doing business with them. Customers like to be listened to and to see their recommendations and suggestions implemented. It is important to let your customers leave their feedback and listen to their concerns. Social media, opinion surveys and reviews are the best for discovering what your customers really think of you and what they value about their experience with you. The information received from these channels helps to shape the customer service strategy and make necessary improvements. How do you Stay Connected with Your Customers? We’d like to hear about your experience. How do you stay connected with your customers and what kind of recommendations can you give to our blog readers? This entry was posted in Articles, Best Practice, Tips and Tricks and tagged customer connection, customer experience, superb customer experience. Bookmark the permalink. You need a point of contact with customers beyond public forums of social media and review sites. If you can be contacted offline that is ideal, but online it can be advantageous to control those responses. A fantastic review collected can be used to help your image. A negative review can hurt, the more customers feel like they can contact your company directly the less likely they are to call you out on social media. Great article with all useful information to stay connected with customers. In this competitive marketplace your business can survive on your kind words for your customers and great customer service and support. Thank you for reading our blog, Lewis. Good read, thanks for posting. Have you any good examples of Customer Outcome dashboards? Keen to see how others measure the customer experience and outcome? I am glad you found my article useful. It is really important to listen to your customers. And by responding to their feedback you show that you listen to them and improve. Great post Olga! Moreover, I would like to add another way to stay connected with customers, ie a customer identity management solution. A cIAM solution makes sure to keep your customer identities safe, centralize their data and offer personalized services to make them stay. What are your views on the same? Thank you for your comment, Megan. I agree that it is important to recognize your customers while communicating with them. Very Nice Blog, Firstly I would like to say thankyou for posting this great tips over here.If we follow this points so definitely we will direct get in touch with our customers. Keep Posting and Ogla can you please share with us how we give feedback to our regular customers? Thank you for your comment, Larry. Regarding your question, do you mean getting feedback from your regular customers? Very insightful and helpful article to readers Ogla. Nice Arctica you have shared here thank you, great afford for writing. Keep Posting..